Government has reiterated it’s commitment towards expanding cancer prevention and control programmes countrywide while ensuring financial stability, sustainability and quality services for all, countrywide. 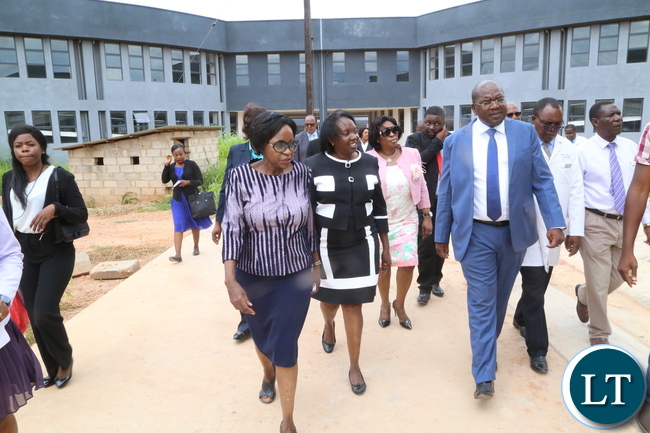 Health Minister Chitalu Chilufya says the prioritized cancer prevention and control is government’s quest to attain universal health coverage as evidenced by the setting up of 84 cervical cancer screening sites across the country. He said President Lungu’s government for this reason plans to construct two new cancer treatment centers in Southern and Copperbelt provinces in order to decentralize cancer services across the country. The country recorded over 12,000 new cancer cases in 2018 out of which 7,380 deaths were recorded. 3,000 new cervical cancer cases were recorded in 2018 followed by Karposis sarcoma at 1, 700, prostate cancer accounted for 1,230 and breast cancer cases were 900. Speaking earlier, World Health Organisation (WHO) Country representative Nathan Bakyaita said thousands of lives can be saved with proper cancer prevention, early detection, access to proper treatment and care. Dr Bakyaita called on all stakeholders at all levels to create an environment in which cancer risk factors are reduced. “ The Zambian government should be commended for its commitment and partnership with cooperating partners which he said has resulted in increased access to cancer services, “ he said. And Senior Chief Mujimanzovu of the Kaonde speaking people called on communities to utilize the cancer services that government is bringing closer to them for early diagnosis and treatment. The traditional leader said 1,049 women were screened for cancer at Solwezi general hospital out which 71 were found with the disease in its early stages, 41 had fully developed cervical cancer and also regretted the death of six women from the disease. Good move and hopefully these hospitals will be sufficiently equipped with Human Resources and equipment/medications to adequately care for patients. A building alone is not sufficient. Nonsense we are currently failing to handle patients adequately at the Cancer center in Lusaka many people still have to go to SA or India for treatment …recently Ponga wrote of a friend who needed access to some piece of equipment known as PET which we don’t have and only accessible in SA at some dear price. Purchasing this life saving equipment estimated at only between $1.2 mn and $2 mn….please bring the current center to international standards before u think of new ones. What’s the problem with Africans kanshi these under hand deals we so much like in construction etc. are Satanic in nature to say the least. Zambia is small you can bear the costs of evacuating people from these provinces to Lusaka for treatment unlike flying yourselves abroad. Proudly showing a fellow African Minister buildings constructed with the help of foreigners …meanwhile when they want to go to undergo basic checkups you will not find them near these places as they know that the drugs there are expired as they bought them. @shameless & jay jay, why ALWAYS throwing blanched comments on everything development that PF government is doing? Idea is brilliant.All we need to do is to support the government of today to establish more health facilities in the country for the sake of future citizens.The issue of furnitures with modern equipments of course time will come later . Furthermore,even HH’s regime if at all he will be a republican president one day . That’s because you are a fooool who doesn’t care how much money is stolen to build anything provided the thing is built…who cares about HH regime here? Consumer Protection Policy is non existent in Zambia. Please OF engage specialists to ascertain the major causes of cancer which has of late become sporadic in our country. 1. Too much burning of plastics in Zambian town and people inhaling those dangerous gases. 2. Too much chemical usage by most farmers for food production. Those chemicals are carcinogenic. 3. Chemicals like shumba which they dust on dry maize to prevent weavels from attacking maize. And people consume this chemical when they grind the maize for consumption. 3. The opaque unrefined cooking oil and the solid cooking oil sold in streets and fake whosales. This is the issue with PF, doing things without consultation or any input from the citizens. The locations should colorate with where most cases are and not just trying to decentralize whatever. There is a need to come up with groundbreaking projects which will revolutionalize our health sector, not these small projects which only excites and dupes people into thinking our health care is changing while it still remains stagnant and backward.